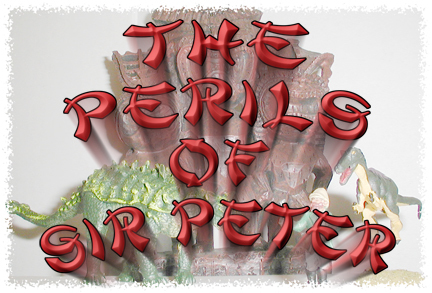 the saga of Sir Peter as he travels the globe at the mercy of various and sundry evil-doers. The rules let you define not only troops, but strange VSF mechanical devices and weapons as well. Basically the world is yours to design as you please. It has a great period feel and games can be quite large (200+ figs) and still go quickly. This is the set that started me off in skirmishing. 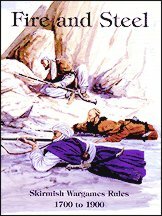 I use this set now mostly for French & Indian Wars and for the Indian Mutiny. This is a new ruleset from Rattrap Productions for adventuring in the era of the great Pulp Novels. Each figure is handled as an individual with players handling 2 or 3 figs. This is a ruleset from Steve Barber Games for playing out games in the Prohibition era. Units can vary in size from just a few figs up to 10 or 12 figures. Each figure is handled as an individual and a player can handle as many as 20+ figs once the rules are known (which doesn't take very long). This is a ruleset from Howard Whitehouse for gaming great Pulp adventures. Each figure is handled individually with players usually handling 1 or 2 figs. Scenarios are played out with the assistance of a "Director" who controls the flow of the game. Players control a "character" fig plus a unit or two of minions/henchmen/general cannon-fodder. Games are centered around archeological digs in old Cairo, but just about any Pulp setting can be handled. This is the ruleset we use most often for large-scale Colonial battles. This is a ruleset from Wessex Games for adventuring in the Victorian Age. Units can vary in size. Each figure is handled as an individual. This Colonial Wargaming Ring site owned byJim Stuht.